The economic fallout from the global crisis has been immediate, extensive and severe. It has been felt in the shock delivered to our financial institutions, in the balance sheets of our major corporations, in growth rates around the world. More damagingly still, it will take its toll far from the City of London or Wall Street – on the jobs, homes and lives of perhaps billions of ordinary people in all parts of the globe. Among the many casualties, and in one of the most important, has been the belief- virtually unchallenged for thirty years – that we had, on the basis of the market’s infallibility, solved the problem of how to run the economy successfully. That conviction has surely been shaken to its core. The simple confidence that the market could always be relied on to deliver the best outcomes can no longer stand in the face of the meltdown produced by market forces that were allowed to run riot. The widely accepted assertion that markets, left to themselves, are self-correcting cannot survive the recession. We can now see what had once been known but had been lost sight of – that when markets operate without any restraint they will inevitably lead to excess and eventually to self-destruction. Even Adam Smith had accepted that markets could and would become the means by which dominant market operators were empowered to act against the general interest. And Keynes had warned that this tendency of markets more generally was exacerbated in the case of financial markets. This was because, he maintained, of the inherent instability of financial markets and their excessive reliance on opinions and sentiment – not to say guesses and hunches – rather than on real things with well-established values. We have seen exactly what he meant. An unregulated market in financial assets was permitted to create and put a price on new kinds of assets which had no more than a speculative value. As long as those assets – futures, securitised debt, credit default swaps and so on – were accepted at face value, they could be offered as security for debt which could then be used in turn to underpin the creation of a new swathe of assets. Those who manipulated these money-making mechanisms must have felt as though they were living the alchemist’s dream. Those who watched from the sidelines – including our political leaders who might ordinarily have recognised their responsibility to provide some safeguards – could only marvel, lost in admiration and envy, dazzled by the riches being generated. And as long as the asset values kept growing, the fact that they were underpinned in real terms only by debt mattered little. It seemed to be a fail-safe operation; no great skill was required, and the mechanisms and processes – novel and untried as they were – were apparently supported and validated by complex mathematical models. Even substantial operational errors, such as the gross over-valuation of assets, could be quickly washed away by the rising tide of asset values right across the waterfront. Even the unskilled could make fortunes – to say nothing of the opportunities offered to fraudsters on an unprecedented scale. But it needed only a scintilla of doubt to creep in about the value of these new assets for the whole ramshackle structure to come tumbling down. When the confidence bubble burst, assets lost their value, but debt did not. The result was – as we have seen – the collapse of the whole financial infrastructure of the world’s major advanced economies. In New Zealand, with our relatively undeveloped financial sector, we have tended to congratulate ourselves on escaping the direct consequences of the financial meltdown. But that was to live in a fool’s paradise. It has not taken long for the financial collapse to have its effect on the real, productive economy, and for the hit taken by our export markets and commodity prices to be added to the impact of the home-grown recession we had entered at the end of 2007. Some of the immediate global lessons to be learned from this experience have been applied quickly, albeit belatedly. The new regulatory regime for financial markets and institutions introduced by President Obama is a recognition that we should never again entrust our economic future to unregulated markets. His example will no doubt be followed by other, but by no means all, governments. President Obama at least seems to understand that we cannot correct and prevent egregious errors by handing back control to those who committed them in the first place. Effective regulation is now surely the name of the game. But, as governments around the world have – with varying degrees of reluctance or enthusiasm – found themselves taking centre stage, many commentators and practitioners, not least in New Zealand, have jibbed at accepting the longer-term and wider lessons to be learned from the meltdown. They have been keen to see government intervention to correct past errors as merely a case of dangerous times requiring exceptional measures. The central task, they believe, is to right the ship; it should then be allowed to sail on as before. They impatiently await the opportunity to return to what they see as business as usual, so that governments can safely be put back in their boxes. This is, however, to misunderstand what has happened. The current role of government in correcting and counteracting recession is not an unfortunate aberration. The recession has revealed an abiding truth – that the market can deliver its unmatched benefits only if governments are there when needed to make good its deficiencies and act against its excesses. The plunge into recession has illustrated beyond peradventure what happens when market operators become so powerful that governments are unable to restrain market excesses. But the response that is now needed to limit and shorten recession delivers a further lesson – that governments must bear a responsibility not only for allowing the recession to develop but also for the measures needed to counteract it. Governments can and must act to correct market failure in ways that the market, left to itself, cannot. Economies are robust things. They would recover sooner or later without intervention. But – as all but the most purblind now recognise – it is the responsibility of governments to hasten the recovery process, and thereby limit the misery that recession inevitably brings about. The reason for this is that governments, uniquely, have the ability to counter the inevitable tendency of recessions to feed on themselves. For most actors in the economy, the demands of self-interest mean that, in a recession, they spend less, invest less, cut costs, employ fewer people. Each individual decision taken by companies or businessmen may be – indeed usually is – rational and justified, but the cumulative effect for the economy as a whole is that recession is intensified.There are those who wish to resist this line of argument. They are reluctant for ideological reasons to accept that governments should ever have a special role and responsibility. They argue that governments should act (if at all) as though they were individual people or companies. According to this view, governments in a recession should also cut costs, spend less and lay people off, as though they were just like households or businesses. But if governments behave like everyone else, the economy is condemned to a deeper and harsher recession than needs be. Those holding this view are so blinded by an ideological hostility to the very idea of government as to deny Keynes’ statement of the obvious – that governments have a unique responsibility to act counter-cyclically. Only governments have the capacity and the duty to defy market logic. Only governments have the resources to over-ride what would normally be market-based self-interest and to substitute for it the wider interest in getting the economy as a whole moving again. Only governments can afford to live with long-term indebtedness if that is what is required in the interests of their shareholders – and that means everyone. Our own government has been one of the more reluctant to learn this lesson.Government intervention, whether to underpin the liquidity of the financial sector or to stimulate demand in the real economy, is certainly necessary if recovery is to be hastened, but it is – importantly – more than a singular response to a singular problem. It is a statement of a wider and ever-present relationship between governments and markets. Markets function best – indeed only function properly at all – if government is ready and willing to second-guess and lean against market outcomes. What is required of governments to save and support financial markets in a recession is equally required – in differing ways – if markets across the whole economy are to function properly. There are of course those who would at this point throw up their hands in horror. For them, the debate is about absolutes. The alternative to the unfettered market is state socialism. They do not see that to recognise and correct the deficiencies of the market is the best guarantee that a market economy can sustain itself efficiently and beneficially. It is vital to understand that this is a lesson of more than purely economic import. The damage that has been done by the unrestrained market has, after all, been more than merely economic. By the time the crash came, thirty years of unrestrained global markets had done largely unrecognised damage on a much wider scale. Not least, the so-called “free” market had converted the world to a new culture of greed and excess. No reward was too outrageous for those who could claim that it was ordained by the market. The huge fortunes “earned” by successful market operators were regarded – by themselves and by cheerleaders such as The Economist – as a proper reward for their brilliance. Self-aggrandisement was treated as the mainspring of all economic progress. Greed was good. A New Labour government in Britain, we were assured, was “intensely relaxed about people getting filthy rich.” The values of those who grew rich by exploiting others were held up by the world’s media for admiration and emulation. The consequences for both our economy and our system of values were certainly deleterious, but the debit side of the balance sheet is further burdened when we can add in the social outcomes. Across the globe, and especially in those countries (such as New Zealand) where the “free” market and the culture of greed were allowed free rein, there was a rapid widening of the gap between the rich and poor – not surprising given that the billions gouged from the economy by the manipulators of financial markets were not new real resources but were filched from the pockets of the rest of us. The result has been societies that are less integrated and more divided – societies increasingly marked by alienated and disaffected minorities who feel that their interests are quite separate from those of the increasingly triumphant, visible and eulogised “rich and powerful”. If we widen our perspective even further, to take account of the threat to the global environment which many believe to be an underlying and developing crisis of even greater dimensions than the global recession, we can again see a prime example of market failure. Global warming, the exhaustion of natural resources, the despoliation of our ecology, the energy crisis, the pollution of water and air, are all consequences of a short-sighted and narrow market-based approach to the interaction of economic activity with the natural world. It is the inevitable outcome of a dogma that says that the bottom line of individual corporations is the only number that matters, and that the shareholders’ interests must necessarily prevail over those of the wider community and humanity as a whole. The recession – and government’s response to it – has laid bare and illustrated a further and yet wider truth – that the readiness of government to intervene is the essential condition on which the market can be made compatible with democracy. The whole point of democracy, after all, is that it ensures that the wider and longer-term interest is brought to bear so that the often harsh and unfair outcomes of unfettered market operations are softened and made more acceptable. That is what governments are for. If the market is infallible and must never be challenged, there is no role for democracy. Governments are then merely bit players and democracy merely a sham – a cosmetic trick to provide the illusion that the rich and powerful can be made to account for themselves. We can profit from this recession if we draw from it the important lesson that the legitimacy conferred by the democratic mandate empowers and requires government to ensure that personal and sectional interests must not prevail over the general interest. There can be no return to the fallacy that the “free” or unfettered market establishes a kind of economic democracy that renders democratic politics irrelevant. The recession and the need for a government response to it may be, one hopes, an exception, but the value of the proposition that democracy rules is a constant.Many of the deficiencies of unregulated markets have clearly manifested themselves within the national context but their true theatre of operations has been on a global scale; the triumph of the “free market” has been, after all, a global victory. The global dimension was an important element in ensuring that, for three decades, it could confidently be claimed that “there was no alternative”.Today’s commentators are certainly justified in pointing to the unprecedented size, power and reach of economic forces that now operate on a global scale. But what has really been significant about the drive to globalisation is that it has been invested with a truly ideological fervour. Globalisation has ceased to be just a useful way of describing a number of related but more or less accidental economic developments, and has become, in the minds of many, a deliberate and coordinated project. It is this ideological element that marks out the current development of the global economy. The market fundamentalism that fuels it is ideologically driven and is intolerant of debate or challenge; according to its supporters, the global market is infallible and produces unprecedented and unalloyed benefit.The rise of the global economy has been, in other words, as much a political phenomenon as it is an economic one, and as such it has succeeded in turning upside-down many of the assumptions and attitudes politicians and others have acted upon for centuries. The global economy is, by definition, an economy in which there is little or no intervention by governments or other authorities. If there were such intervention in any part of it, so that the intervention made that part operate differently from the rest, it would cease to be a single market and would instead be a series of differentiated markets in which different rules applied. The global economy therefore operates on the basis of an acceptance by most politicians that intervention is to be eschewed. There is a recognition on the global scale of what at the national level would be described as the monetarist view that governments should limit themselves to establishing conditions of monetary stability and leave the economy to look after itself. These trends are clearly seen in New Zealand – perhaps the most enthusiastic and ideologically-driven participant in the global market, and a leading innovator in the mechanisms of monetarism.The acceptance of this view has required left-of-centre politicians to make an historic reversal of a fundamental position they have taken in what has probably been the central debate of modern politics. For at least 200 years (or, in other words, for as long as we have had what would be recognised in modern terms as an economy), that debate has raged. It is a debate to do with the role of government in relation to the economy, and it has been the central issue that has divided right from left.An early statement of the positions of the protagonists in that debate is to be found as long ago as 1810 in the majority and minority reports of the British Select Committee on the High Price of Gold Bullion. The Select Committee focused on a relatively narrow point – whose responsibility it was to determine the volume and value of the money stock – but the debate reflected much wider issues concerning the responsibilities of government and the extent of its role. While the language may be outdated, the ideas are contemporary. Sadly, the debate itself has virtually been abandoned, most often by those who do not understand that they have given up anything of value.On the one hand has been the view – generally supported by the majority in 1810, who concluded that government should have no discretionary power to adjust the money stock – that governments have very limited capacity to manage the economy. Any pretension to extend that power will not only be self-defeating but also – because of the distorting effect on the proper and unfettered operation of the free market – positively damaging. Governments, according to this view, are not, or at least should not be, actors in the economy in their own right. They should not be, because their motivation will usually be a non-market one, and to use the power of government to intervene for non-market purposes in the marketplace will inevitably distort the market’s proper operation. More importantly, they should not even claim a role as policy-maker in shaping the course of the economy, since it is very unlikely that policy-makers will reach as good judgments as would the unfettered market.Governments should instead limit themselves to those aims that are their proper concern. The defence of the realm, the maintenance of law and order, the underpinning of a system of law and practice that allows commerce and business to operate efficiently – this is the proper role of government. In the field of economics, the role of government is similarly restricted. It is limited to the maintenance of the value of the currency, as an essential part of the landscape in which business can operate efficiently. It matters little what the numerical value of the currency might be, as long as it is stable enough over a sufficient length of time to enable business decisions to be taken with confidence. Government is entitled to use those instruments of monetary policy as are necessary, such as interest rates, to secure the desired stability. Beyond that, however, governments should withdraw. Once monetary stability has been established (and this is essentially a technical operation that can safely be left to officials and is thereby insulated against the vagaries of democratic pressures), the economy can safely be left to operate by itself. This is not a failure of responsibility but a proper recognition of the respective roles of government and business.The alternative view postulates a much greater role for government. According to this view, government is a major player in the economy, both as a direct and significant actor in its own right and as a coordinator of other actors and a maker of policy. This inescapable role means that government should accept, and according to some views seek and welcome, a responsibility for the performance of the economy.That performance is to be measured not according to purely monetary criteria but according to real phenomena such as output, employment and investment. Government should therefore set its sights on achieving targets such as full employment, a reasonable rate of growth in output, and an effective level of services. Stability should be sought not only in terms of monetary conditions but also in matters such as the level of demand. Particularly in the matter of demand management, governments will often aid economic performance by taking a deliberately counter-cyclical stance. The economy will also perform better if the power of government is harnessed to the needs and interests of industry, and if government undertakes those functions – such as the provision of major infrastructure – that cannot easily be carried out by private industry.Historically, the right in politics has on the whole identified with the first view, while the left has endorsed the second. It is hard to exaggerate the significance of the left’s abandonment – over the last three decades – of its historic commitment to the idea that the power of government should be used to promote the general good in favour of an acceptance that the task can safely be entrusted to the “free” market instead. This barely remarked reversal has removed from the left any identifiable ground on which to stand. All politics in the end is a response to a fundamental characteristic of social organisation. All societies demonstrate an inevitable tendency for power to concentrate in a few hands. The power may be expressed in physical, economic, social or hierarchical terms – but at its most fundamental it is power to make choices, the freedom to choose, even at the expense of and against the interests of others. In any society, those who are stronger, cleverer, or luckier, or who enjoy some other advantage, will inevitably acquire more power than others. They will then, with equal inevitability, use that power to enhance their advantage, accreting to themselves differential privileges which will make them yet more powerful, allowing them to entrench that advantage and defend it against attack, and by doing so to reinforce the disadvantage of others. The response that should be made to that intensifying concentration of power is the central and defining issue of politics – and the key characteristic of the left response has been, traditionally, to resist and counteract it. A society in which the market dice are allowed – indeed, must be allowed – to lie where they fall is inevitably one in which power concentrates in fewer and fewer hands. A government supposedly of the left that feels unable to challenge market outcomes can have nothing to say – however it is dressed up, whatever cosmetics are applied – to those who look to it for social justice and a more integrated society. How and why did this flip-flop occur? How did these free-market doctrines become so dominant? Why did governments – even those of the left – not ensure that market forces were tempered by a concern for the interests of the majority? The answer lies in a single word – globalisation. It was the development of the global economy which incapacitated governments and which left the field uncontested to market forces. The individual steps by which this was achieved need be only briefly rehearsed here. One of the earliest was one that masqueraded as a purely technical change that would help international trade and investment, and that was sold to the ordinary citizen as a welcome reduction in bureaucracy. That change was of course the removal of exchange controls by Reagan and Thatcher so that international capital was free to roam the world in search of the most favourable investment opportunities. In one step, the rules of the game had changed hugely. Investors no longer had to comply with the requirements of elected governments. Instead, governments found themselves played off against each other by investors who commanded greater and greater resources as the now global economy was funnelled into fewer and fewer hands. Now, it was governments that had to sue for terms, and who would lose out in the competition for investment if they did not comply with the demands of the multinationals. The world’s major corporates could, in effect, set the political agenda in each individual country. The price they demanded for what was seen as essential foreign investment was a menu of measures drawn from the text-books of right-wing ideologues and familiar to any observer of the New Zealand scene. That menu included a “free-market’ (or monetarist) economic policy, low business tax rates, accommodating rules about the repatriation of profits, industrial relations laws that reduced the power of trade unions, health and safety legislation that was not too onerous, a regime that allows the “externalisation” of costs to the environment (or, in other words, the transfer of those costs to the public purse), and labour costs aligned to the lowest international benchmarks. The investors, on the other hand, now understood that they could exercise their power quite irresponsibly; it was, after all, governments – not the investors – that had to answer to their electorates. The investors answered to no one but their shareholders. Most costs could be “externalised” or passed on to taxpayers who no longer had a voice. And, as voters began to understand that their governments could no longer protect them, confidence in the democratic process began to weaken. It is no accident that, with the rise of the global economy, voter apathy is an endemic problem in the older democracies. Voter turn-out in the leading democracies, and particularly in the United States, is notoriously low, and it is on a downward trend in most countries. Even in a country like New Zealand, where there has traditionally been a commendably high participation rate in general elections, voter interest is declining. In the United Kingdom, while the turn-out in the 2005 general election showed a tiny improvement on the 2001 figure, both results – at just over 60 per cent – were at historically low levels. And the numbers voting in the recent European elections were shamefully low. At around the same time, monetarism – the doctrine that managing the economy was a more or less technical exercise in controlling inflation (the only goal, it was said, that mattered) by regulating the price of money – became the accepted wisdom, on the left as well as the right. And, in a development introduced in its modern form in New Zealand, this technical task could safely be entrusted to unaccountable officials – bankers no less – so that, in one simple step, democratic government was excluded from perhaps the central function – the management of the economy – for which it was elected. These ground-breaking changes were reinforced by the re-shaping of political structures in the image of international capital. Multi-national investors found it increasingly irksome to have to deal with national governments, each with its own set of requirements, each reflecting the particular interests and priorities of their own voters. They insisted that economies would function more efficiently if those controlling investment capital could deal with authorities, like the European Commission, that matched their own multinational structure and scale – and that were not democratically elected, but were instead multinational bureaucracies whose goals coincided with their own. So powerful was the momentum towards the integration of national economies in the name of greater economic efficiency that no one seemed to notice that the long-term consequence was not only an actual reduction in economic efficiency but also a political loss of a most serious kind – the replacement of democratic governments as the ultimate authority by multinational capital. The ability of multinational capital to set the political agenda meant that a doctrine that could never have been directly sold to voters in individual countries – the view that markets are infallible, that they must not be regulated or interfered with in any way, that the interests of shareholders and the bottom line are all that matters, and that governments must step aside while market forces have their way – became the dominant driver of the world economy. The concession that it is the market that is the only legitimate and effective determinant of economic activity, and that government has only a limited role to play in holding the ring, is not a matter whose effect is limited to the management of the economy. The implications go much wider. If the left concedes that, on the central question of economic policy, decisions can safely be left – indeed, must be left – to the market, then what case can be made for saying that the market cannot be trusted in important but less central matters such as the delivery of health, housing or education? If the market is infallible or at least unchallengeable on the most important issues, then the rest of the game has also been conceded. And if the fundamental question of managing the economy is to be handed over to unelected officials, and thereby removed from the democratic control of voters so that they no longer have the opportunity of expressing a view or choosing an alternative, how could it be argued that it is essential that other, less important, matters should be subjected to democratic control? Are democracy and the responsibilities of government to be limited to the detail and the trivia, while the essential issues are decided by unaccountable experts? To accept these propositions, even implicitly, is entirely destructive of any political position that treats democratic control and government responsibility as the central features of a proper system of government. It is because the left has indeed accepted those propositions that it has found itself intellectually bankrupt and lacking in confidence. Very few left politicians have analysed their situation in this way, preferring to persuade themselves that they are merely acknowledging the – largely undefined – inevitable (in matters like central bank control of monetary policy) and pretending that this central concession leaves intact their political positions on other issues. The abdication of the left has been more than just a failure of omission. The democratic state that exercises its traditional concern for all of its citizens, and in particular for those who need its help, has not simply ceased to exist; it has been turned against itself. The revolution that has occurred under the influence of the global economy has not meant that the activist state has disappeared; it has merely changed its role and focus, and operates in a different interest. Hence, the modern state is increasingly activist in the causes of producing more police and prisons, in treating views at variance with orthodoxy as subversive, in regulating the labour market so as to force people to work for lower wages, in making life difficult for immigrants and other non-conformists, in restructuring the agencies that deliver public services, and in redefining the concept of public service virtually out of existence so as to ensure that private interests can pursue profits across the whole economy. As a consequence of globalisation, the state has been recruited as just one more soldier to the cause. It has become just one more mechanism for ensuring that the prescriptions of global investors are followed faithfully. This is not just a matter of the freedom to debate and choose different political systems, remedies and approaches. It is also a real loss of freedom to act and to govern one’s own life. The loss of economic power, accompanied by the closing off of the political escape route and safety valve, means a real loss of freedom for the majority of people. The test of a free society is the degree of freedom enjoyed by the least free. Freedom is not an absolute; it is the degree to which one is free to act and choose in relation to the same power exercised by others. If power is concentrated in fewer hands, so that they have comparatively more power of decision and choice, then by definition others are less free. 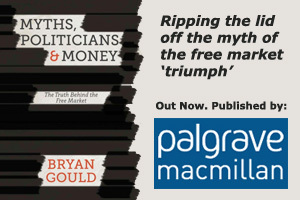 Those societies that are part of the global economy can therefore be said to be less free than when they decided – however imperfectly – their own affairs and futures. It may be questioned, however, as to how far the problem is unwelcome to those who now control and dominate the political debate. Voter apathy might be seen as encouraging evidence that the real political debate is now over – that we have reached the “end of history” and that, for the first time in the modern era, there is no longer any real challenge to the views and interests of the rich and powerful. It is no accident that the constant mantra of political leaders like Margaret Thatcher was that ‘there is no alternative’. It is very much in the interests of the purveyors of the new orthodoxy that dissent should not only be discouraged but be convinced that it is pointless and hopeless. This victory is all the sweeter because it can be represented as the proper and defensible outcome of the democratic process. The voters are apathetic, so it can be argued, because they no longer have anything of substance to concern themselves with or to contest. Apathy is, in fact, contentment and an endorsement of the dominant orthodoxy. All the processes and trappings of democracy are, after all, in place. The opportunities are there for the expression of different or contrary views. If they are not taken up, surely that is evidence that those views no longer have traction? This is the final irony. When the democratic process has been hollowed out so that there is little of substance left, the mere – perhaps only apparent – existence of that process can be used to silence the critics. A victory won by force or overtly in the face of democratic process would be hard to justify or defend. But a victory that appears to have been secured in accordance with democratic process can not only be justified but celebrated. So, what is now to be done? As President Obama’s Chief of Staff, Rahm Emanuel remarked, a good crisis should never be wasted. The fact that thirty years of global “free-market” economics have not only culminated in recessionary crisis but have raised a wide range of yet more fundamental questions about governments and markets provides us with an opportunity that must be taken.It is an opportunity that arises in two arenas – the national and international. This is not the place to set out a complete agenda but we can at least sketch out the approaches that will be needed if we are to learn and apply the lessons of the past thirty years. On the national level, it is surely now clear that it is governments, not banks, that underpin our financial systems and our currencies; and if that is so, should we not recognise that banking and the creation of money and credit are public functions for which public accountability should be demanded? And should not the management of the economy be the first function of democratically accountable government and not sub-contracted out to unaccountable bankers and officials?In the light of undeniable statistical evidence of widening inequality and fractured societies, should we not consign to the dustbin of history the discredited “trickle-down” theory of wealth creation, and acknowledge that a fair distribution of wealth will not happen by itself but must be a deliberate matter of government responsibility? And is it not clear that markets are valuable servants but dangerous masters, and that supervision and monitoring in the public interest are needed if goals like full employment, responsive and effective public services, and social cohesion are to be achieved?On the international scale, is it not clear that we need new forms of international cooperation to restrain the irresponsible and excessive flows of “hot” money and the volatility of exchange rates, and to provide better prudential supervision of international lending and greater responsibility of international investors to the communities in which they invest? And should we not apply the lessons of the recession to issues beyond the immediately economic, so that we do not leave to the short-sighted and the self-interested the issues of ecology and the environment that will decide our future as a species? Why should New Zealand not take the lead in promoting this new international agenda?This most recent recession is significantly different from its predecessors, in that we now have a chance to understand better what has caused it. It provides, as a result, a potentially critical turning-point in our relationship with our planet. We can now perceive, albeit imperfectly, where irresponsibility and lack of foresight could lead us. There will be many who will want to ignore the warning signs. It is vital that there are also many who do not.